I never understood why you would buy, use, or consume artificially flavored liquors. This really goes against my style. The vodka boom is still going strong and many Americans love their flavored vodkas. Well I’m trying to change people’s minds. 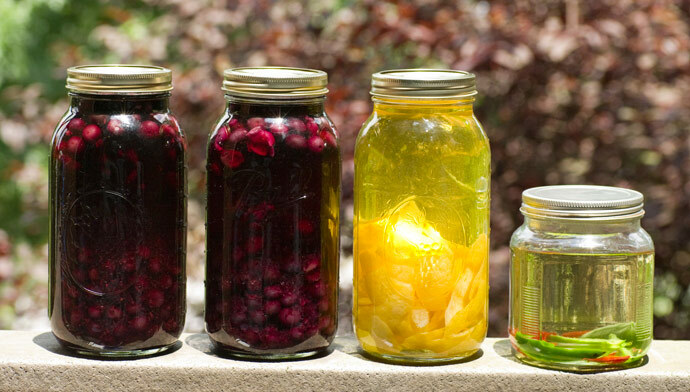 Infusing your own spirits is easy. It just takes some time, but in the end you will have real flavors and some really fresh cocktails. I used Infused by Susan Elia MacNeal’s for reference. 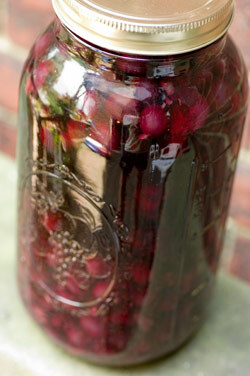 Always use sterilized mason jars, shake once a day, and keep away from bright sunlight. Slightly cook the blueberries until some of the natural sugars start to release. The blueberries should be slightly firm not mushy. Infuse away from sunlight for 5 days. This fresh infusion will blow your mind and you will hopefully never buy a citrus vodka ever again. Zest lemons with no white pith. I use a potato peeler and then a knife to remove excess white pith. You could use a microplane zester here as well. Infuse for 5 days. Strain and rebottle. Yes, it’s that easy and tastes like real lemons. You’ll only need to infuse the tequila for two days. Once you have your jalapeno infuse tequila you’ll have ammo for some seriously tasty cocktails that pack a punch. Here’s the preparation for the pecans. First soak your pecans in water for 30 minutes, then strain. Place pecans on a baking sheet and preheat the oven for 300 degrees. Sprinkle with salt, pepper, and cayenne pepper on the pecans for flavor. Bake for 20 minutes. 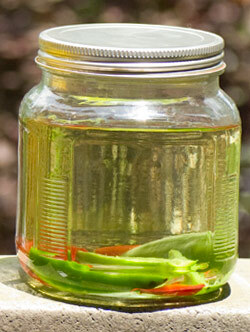 Allow to cool and place in a sterilized mason jar. Top pecans with bourbon and infuse for 4–5 days. Strain with a coffee filter or Brita filter to remove any sediment. I’m currently looking into agar clarification to help remove sediment and improve the overall appearance. Here are some recipes I used with these infusions. garnish with blueberry sugar. Dehadrated blueberries then crushed with mortar and pestle, combine with sugar. I infused my own lemon vodka and left it in longer than 5 days. More like 10 days and it turned yellow. Is that ok? That’s ok. It’ll probably just have a strong lemon flavoring. yeah i forgot about my lemon vodka infusion too. much like i forgot about my garden. left the zest in for 2 weeks maybe. it looks like banana snowball syrup. can’t wait to try it! Really great your infusions!I’ll try some of them and i will tell you about my impressions.Thanks. Thanks! I can’t wait to see what you come up with. Any recipes to make a “real” vanilla vodka? Greg, I would recommend getting this book to help you with your infusions, “Infused” by Susan Elia MacNeal. I haven’t tried making vanilla vodka but my infusions usually take 5 days or a month. I would suggest buying two quality vanilla beans, split lengthwise, drop into a bottle of vodka, and infuse to your taste. Infuse away from direct sunlight and shake daily. When you’re happy with the taste, strain through a coffee filter and enjoy. I took your advice and pre-baked the blueberries for our blueberry-infused gin. Totally works. We waited about ten days and the results were phenomenal. Awesome. Glad it turned out so well. What are you planning on using the blueberry gin in? I tried infusing Tequila with jalapeños last week, but I also added lemon and orange. It turn out very well after only a day(I left the seeds and the veins on it), Next time I’ll probably add more tequila and wait a little longer. I also did Rye whiskey with cardamon seeds, cloves and cinnamon, and it was very intense before the third day, the flavors are there, but I haven’t use it in any cocktail yet. Those sound great. Good idea adding the citrus to your tequila infusion. Soon I’ll be posting a new article on a chocolate infusion with rye whiskey. Keep an eye out. People have been loving the cocktail I make with it. Just discovered your blog, I’m loving it. Full of great cocktail information. I’ve been interested in cocktails/mixology for a while now. I’ve been trying my hand at infusions and home made bitters. Wow! That sounds wonderful. Did you take any pictures? If so, I’d love to see them. Share them on my Facebook page. Thanks Josh! I don’t have any pictures but my next batch I’m definitely going to. I do have video documentation of what I’m doing. I blended and bottled up my Thai Infusion yesterday. If you’re interested in checking it out I have been posting my videos on youtube. How do you store the final product? How long does it keep? These look beautiful and would make great gifts! Sarah-They should be preserved in the alcohol. It would probably best to keep them refrigerated but I don’t think it’s necessary. I wouldn’t keep them on a hot widow sill. You will probably consume them before you have anything to worry about. I was curious when you were going to post your chocolate infused rye? Can’t wait to try it. Love this site! Just discovered it! My manfriend loves his gin&tonics.. I wanted to home infuse some gin as a gift, dyu think the blueberry gin would go alright in a g&t or is it only suited to cocktails/rocks? If so, can you suggest a better flavour? Blueberry gin and tonics are great! Feel free to play around with maybe raspberries, or rosemary, etc. Pecan infused bourbon comes out great! I made that and a maple syrup infused bourbon which I used in the following recipe. Ice glass for that extra chilly concoction. Mix together in shaker with ice. Garnish with a cherry and serve. I have to say now that I have started to do my own infusions I can’t wait to do a peach version so that all the alcohols in this are my own. Thanks for the website. Thanks for sharing! Let me know how your peach infusions go. I found with my blueberry infusions to slightly cook the fruit to release some natural sugars. Thanks for the tip. I also wanted to add that I am very big into eliminating waste, so I had to come up with something good to do with the pecans from the pecan infused bourbon. So, I decided that after I did the infusion I needed to dehydrate the pecans prior to cooking, so I put them back into the oven at 350 degrees for 20 minutes. Then I made my 1st pecan pie. It has a nice hint of bourbon flavor and I am going explore this direction with every infusion. Nice use of the pecans. I might have to try that out. I’ve also found myself baking the pecans. I usually give them a coat of brown sugar. And recently I’ve added them to some homemade bourbon ice cream. I am going to try pecan vodka. Cathead is the only distillery making it but shipping from Mississippi to Washington is exhorbent. The say the they “mastercate”? for 4 to 6 weeks. What do you suppose that means. A good recipe for a pecan tonic drink is in the June/July, 2014 issue of garden and guns. (Hopefully, you’re still notified of this query.) This sounds great! My family grows pecans in New Mexico. I’m getting married in May. Instead of the dollar dance, the bride to be and i will be tending bar for a segment at the wedding for tips and making a pecan version of a black walnut cocktail we had the night i proposed to her. About how much bourbon do you lose to the now-soaked pecans? This cuts any need for nut-flavored bitters, would you think? I have some black walnut bitters i really like and i’m about to try out El Guapo’s chicory pecan bitters anyway. Michael — how did you make the maple infused bourbon? Thanks! I just started infusing today! I am really excited about it. Wanted to bounce some ideas off you guys.…was thinking about doing a gin and mint/lime. Has anyone tried this? If you want to balance things appropriately can you add things later on down the line? For example I’d like to do a cucumber melon but I think the cucumber is a light flavor and I would like to have that flavor more established before I add a stronger flavor like a melon. Right now I have the cucumber in the vodka not sure if I can add down the line to balance the flavor appropriately. I find that its better to muddle things like water based fruits and vegetables, (ie melon and cucumber) they seem to absorb the spirits and turn rather then infuse their flavors. Fruits, especially berries do well releasing their flavor over time. I have my second batch of strawberry gin this season going currently. The first batch I included basil which turned and didn’t add much flavor. This time I muddled the fresh basil into my strawberry gin with much better results. Experiment with small batches and if it works, go big. I agree Brian. Juicing these water based fruits can also be so refreshing and can give your cocktail volume. Infusing herbs into spirits doesn’t really work. It ends up being bitter or vegetal. How long do you infuse your strawberry gin? I’ve found that it only takes 3–5 days, after that the fruit starts to fall apart. Once the berries have turned white and plumped up I strain the batch and then crush them in the strainer to get most of the liquid. The flavor will greatly very on the ripeness of the fruit. I had a batch last year that was made with over ripe fruit and turned out so sweet that it had to be cut with citrus but the flavor was amazing. I have not been able to reproduce it yet this season. The taste is amazing but I have to say the scent and color really calls for it to be served up on display. Some friends of mine infused tequila with vanilla beans, augmented with a little agave nectar. It made for incredibly smooth margaritas. Eric how long did you infuse the vanilla beans and how much? Looking forward in making some great infused drinks for our new restaurant. Anyone have some suggestions on what I should start with? I would say the lemon vodka is my most popular infusion and would be a great start. Be sure to scrap off the white pith on the back of your peels. Let us know what you come up with. For the Lemon infused vodka, is it only the lemon zest that goes in it with no whites or is it lemon zest and the actual lemon that goes in? Is it okay if pulp gets in or is that a no no? Thank you! Just the peels with no white pith. 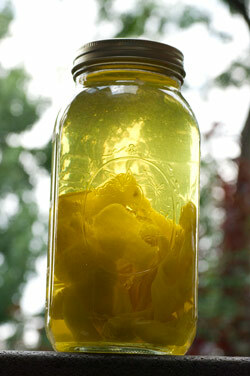 Somewhere on the web is a recipe for Italian Lemoncello. It is made by infusing a couple of dozen of lemon peel zest with a quart of 150 proof spirits. dandy after dinner drink straight! Love the blog, just bought a bar and have made my first 2 batches of vodka, one with apples and the other with citrus, though I looked on another website and they said to leave the lemons whole so not sure how it will turn out. Lyn, I wouldn’t infuse the whole lemons. You are going to pick up some bitter and sour flavors. With the just the peels you get a nice clean lemon flavor. Can frozen blueberries be substituted for fresh in making a vodka infusion and in what quantity? I just found a chai liqueur and found it was a great addition to a cocktail. With that in mind I have been considering making my own. Has anyone tried this and if so can you give me a good starting point? 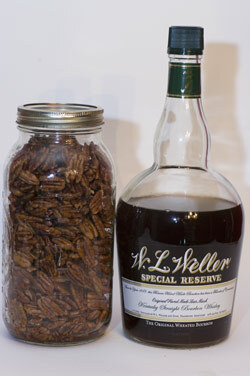 Has anyone found a use for the pecans once they’ve infused the bourbon? I was thinking it might be tasty to dehydrate or roast them after. Has anyone tried anything similar? Kat, I have roasted the pecans after the infusion. I tossed them in a rich simple syrup and baked them. Be careful though because they are soaked in powerful alcohol. I left the oven door open a crack to be safe. Cheers! Hey guys! I have done the pecan recipe a few times and its amazing every time. This last time I added to the recipe. I added cinnamon. Simple but made a difference! After I pull the pecans from the bourbon, I cool them in simple syrup and reduce it down by half. Cook it for 20–30 mins on high heat. Once “glossy” i strain the pecans, save the now fresh Pecan Simple Syrup and then cook the pecans one more time. I add a little bit of salt before i cook them the final time. Once done, I jar the now delicious pecans and serve them with this drink I came up with. Shaken and served over a giant cube of ice. It’s wonderful. I have a picture I would love to share on here. Love the creativity! Keep em coming. Big fan of your site. I want to make the blueberry infused bourbon in hopes of concocting a punch for a summer party. First question; I typically strain out the infused liquor once the desired flavor has been achieved (typically with anything acidic) but in the case of fresh vanilla bean pods (3 with a slice down the center) I will leave them in until the bottle is empty. Should I leave the blueberries in the bourbon or strain out? I was making a Lemon Blueberry Tequila infusion and took the advice to shake the infusion a little. Now that I did that, most of the blueberries took over the bottom. Do you think this will alter the taste? Should I strain and move the blueberries around again so they are more spread out? Thanks! Totally normal. Let the alcohol do its magic. Keep shaking and tasting the infusion everyday. Should be ready in 4–5 days but this is up to you and how you want it to taste. Hello, What can you use with the pecan bourbon? I had a martini once with that. but I cant remember what was all in it. Dory, I have a cocktail on here called the Dorthy Dandridge, give it a try. Just finished my first batch of infusions! I strained and triple filtered (coffee filters) each flavor, but there is still a powdery sediment that collects at the bottom. Is this typical/normal? Or is there a way to remove/avoid it? Thanks so much! Love your site! Samantha, What was your infusion? The coffee filter should of done the trick. Maybe try to freeze the infusion and the sediments will clump together, making it easier to filter. Love your website and was hoping you could help me. I want to do some home infused spririts as wedding favours for my upcoming wedding and I’d love your advice. I’m looking to do a maple infused bourbon or whiskey, do you have a recipe or recommendation for this? Have you tried it before? I’m also pretty keen to try your blueberry infused vodka! Sounds lovely. Would you recommend the liqueur over the spirit? Not sure what would taste best as a shot after dinner. I’m also looking for your expertise of having tried and tested so many great recipes to see how long you should let the spirits infuse and where? In the fridge or not? I guess since we are making quite a few jars, wondering where to keep them all. Thank you so much in advance and I very much look forward to hear from you. For the maple bourbon, I would keep the maple separate. I usually make a 1:1 syrup with maple for cocktails. Have you seen my Les Paul recipe? For the blueberry infusion, I would slightly cook the blueberries with a pinch of sugar. This will help break down the skins, speeding up the infusion and this also brings out some of the natural sugars. I found this only takes @4 days for me. You can do this to your taste. If you’re look to just sip this stuff then maybe do the infusion a little longer. I just keep my jars in a cool dark place, no need to stick them in the fridge. I tried your pecan recipe and did it as follows..
tossed the pecans in cinnamon and baked at 350 for 30 minutes, tossing regularly. placed in Glass container and let cool. poured rye over the top and sealed. infused for 5 days. the results were awesome. super buttery texture, subtle cinnamon spice. Hot toddy’s for days. This is just a wonderful site! I’m so excited! I want to try making some peach Vodka and Bourbon. I’m thinking I should blanch and peel the peaches (pesticides and all) and would you muddle them? I plan to let it set for a month because I want a strong flavor. Then I hope to keep it in the refrigerator for a couple 3 months, if possible. Do you think it will go bad? Should I do the infusing part in the refrig also? putting them in the oven, to see if this will enhance the flavor of the infusion. I also may add a few cacao beans to the mix. I have a blackberry infused vodka that is hazy. Can I put it through a Brita? I’ve heard it will remove some of the flavor but coffee filter takes SO long. Any suggestions? How about a piece of clean fine cloth, then you could squeeze it through? Pecan whiskey… I made one recently. I would add that you can do a fat wash and it will likely clarify. Put it in the freezer a few days. Youll see the oil settle in the bottom. Run it through a coffee filter. Repeat and Wahlah. It takes a while to strain though. I do have a bitter/very dry characteristic in minefrom the pecans though. Not sure how to prevent or repair that. I make my own Limoncello, infuse the vodka exactly as you described with lemon zest, then after a month make a sugar syrup and add cold syrup to lemon vodka. Put back in cool dark place for another month and voila, Limoncello!